Di incumbent Govnor of Plateau State, Simon Bako Lalong of di All Progressives Congress (APC) don win di 2019 govnorship election, afta INEC declare am winner one day afta supplementary elections. 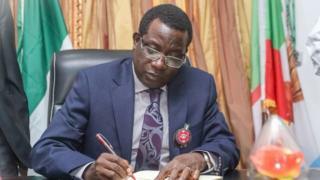 Lalong win wit 595, 582 votes to defeat Senator Jeremiah Useni of di Peoples Democratic Party (PDP), wey get 546, 813 votes. Di Independent National Election Commission, wey be Nigeria election office, declare di winner afta di 23 March supplementary elections wey dem do for 40 polling units inside nine local goment areas of di state. Oga Lalong don go social media to thank im voters, and to tell pipo of im state say "dis na time to put political differences to one side" so as to move forward. Before di supplementary election, APC bin don get 583, 255 votes against 538,326 votes from PDP from di election wey happun on 9 March. But INEC declare say dat election dey inconclusive because di 44, 929 votes wey APC take lead, less than di 48, 828 cancelled votes from nine local government areas.